In this article, we'll learn why the HTML5 History API came to be. Before this API existed, we often used hash values to change the page content especially for heavy, single page applications because changing the URL was not possible without refreshing the page. Additionally, when you change the hash value for a URL, it does not make any changes to the browser history. Now, however, both of these things are available with HTML5 History API and it makes possible to develop script heavy, single-page applications without having to use hash values. It also allows us to build applications in an SEO-friendly manner. Furthermore, this technique allows us to reduce bandwidth - but how? In this article, we will be developing a single-page application with this API to demonstrate exactly that. That means we will load all required resources on the first page load. From there onward, the application will download only the required contents. In other words, instead of loading all resources all the time, it will load only required resources from a second content request. Note that you need to perform some server-side coding to deliver only partial resources instead of full page content. At the time of writing this article, browser support for the HTML5 History API is quite good, We can review its status here. This link will give you a glimpse of supported browsers but it is always good practice to detect support for particular feature before using it. Additionally, I would suggest taking this article to Detect Support for Various HTML5 Features. If your browser does not support history API, then you can use the history.js polyfills. Both of which allow us to add and update history state, respectively. Both work in the same manner and expect same number of parameters. In addition to these methods, we have popstate event. We will see later in this article for how and when to use this popstate event. state can store a JSON string and will be available for popstate event. title is a parameter is disregarded by the majority of browsers for now, so better to set it to null for today. url can represent any URL. It will be updated with the browser's address, and it won't care if that URL exists or not. Most importantly, it won't reload your web page. The major differences between these methods are that the pushState will add a new entry in the history stack and replaceState will replace current the history value instead of adding new one. If you are still confused in both these methods, then let's demonstrate the same case with better example. Let's presume we have stacks of two blocks labeled 1 and 2 and you have block labeled 3 in your hand. 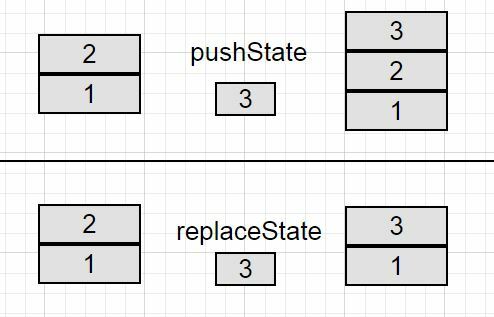 Now, when we perform pushState, block 3 will be added to an existing stack so stack would have 3 blocks. Now assume the same stack with two blocks and one more in your hand. When we perform replaceState, it will pick the block 2 out of stack and place block 3. So the number of history values will remain same. pushState, on the other hand, increases history count by one. The below image shows the same demonstration. Thus far, we have covered the pushState and replaceState events in order to control the browser history, but suppose we have a variety of fake history that we have totaled in the browser. The user may or may not redirected to that page. In such a case, it will be a problem when user hits the browser back and forth button to navigate to history pages. Though you may expect popstate to be fired when the pushState or replaceState methods are addressed, but in reality, it is not the case. Instead, popstate will fire when you are navigating through the session history entry, either by hitting backward or forward buttons or using the history.go or history.back methods. In WebKit browsers, a popstate event would be triggered after document's onload event, but Firefox and IE do not have this behavior. This API has created a great impact on how our web application works. It has removed the dependency on hash values in URLs in order to make it easy to create efficient, SEO-friendly, single-page application. It's a really nice API, isn't it?